FoodSwoon FoodSwoon | Page 8 of 8 | Recipes and musings inspired by daily life and entertaining. 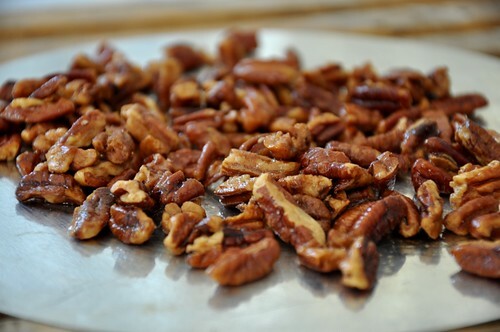 Whenever I cook with pecans, I am reminded of high school summers spent working at a candy store that specialized in pecan pastries, pies, candy and ice cream. Every day, delicious smells drifted through the building as the kitchen staff whipped up various pecan confections as well as made-to-order items like pecan-chicken salad sandwiches and pecan waffles, which I fondly remember as always being served piping hot, topped with roasted pecans and drowning in pecan-maple syrup. When the store, we’ll call it The Barn, was busy, I would turn dizzying circles behind the register, scooping ice cream, weighing candy, slicing fudge and ringing up customers. When it slowed down, I would catch up on my never-ending list of tasks, like restocking shelves and scrubbing fingerprints off of the display cases. The owners, Mr. and Mrs. B., were hard workers and expected the same of their employees. The Barn was a popular pit-stop for out-of-towners en route to the beach because of its proximity to the highway and because it made arguably some of the best ice cream in the state of Alabama. Mr. B. developed all of the ice cream recipes himself, and I loved hearing him reminisce about the numerous test batches they threw out before they got the ice cream just right. During the store’s busiest days, it never failed that when I’d finally catch my breath, a bus would turn into the parking lot and dump out dozens of customers eager to try one of The Barn’s famous pecan ice creams. 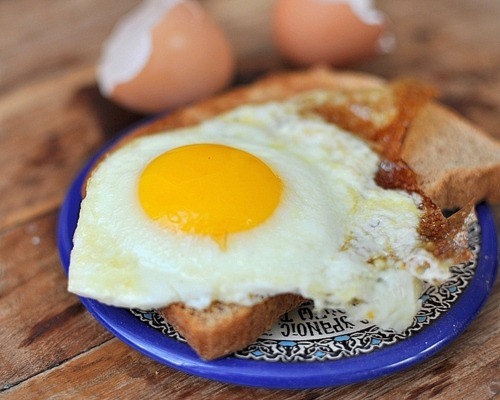 I hesitated calling this post “The French Egg,” lest I give anyone the wrong impression. I am not declaring this is the definitive way to cook an egg à la française. This is just my favorite way to fry an egg, and it happens to be inspired by French Chef Fernand Point. I developed a greater appreciation for the egg after reading La Bonne Cuisine, a culinary masterpiece that dedicates 26 pages solely to the preparation of l’oeuf, including recipes for “eggs in brown butter” and “deep fried eggs stuffed with mushrooms and ham.” First printed in 1927 and translated into English in 2005, La Bonne Cuisine is the French housewife’s equivalent of The Joy of Cooking. 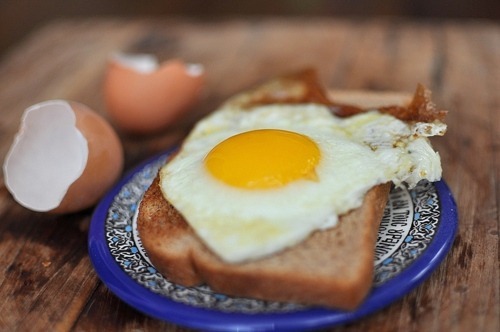 La Bonne Cuisine recommends cooking eggs in a warm oven to achieve the perfect oeufs sur la plat (fried eggs). However, I prefer pan-frying my eggs. After some research, I came across Chef Fernand Point’s method, and it produced exactly what I was looking for: an evenly-cooked, creamy-white egg with a velvety yolk. This summer dish is another inspiration from our dining experience at Husk, where we ordered a melon salad that was plated so beautifully I felt guilty plunging my fork into it. 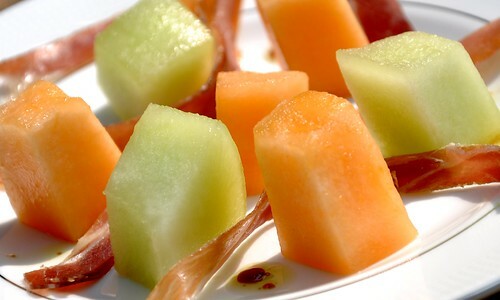 We loved the sweet-and-savory flavors of cantaloupe, honeydew melon and country ham, and the peppery honey vinaigrette was a nice accompaniment. The most intriguing ingredient in the salad, however, was what appeared to be a nearly-translucent melon, dispersed in shavings around the plate. This mystery melon, we learned, was a sprite melon – a small, white melon with an impressively high sugar content and accents of apple, pear and watermelon. Word to the wise: do not fall in love with the sprite melon unless you live in or close to North Carolina, where it is exclusively grown. I had to learn the hard way. In my early twenties, I spent a year covering sports for a newspaper in Fort Wayne, Indiana. I worked from 5 p.m. to 1 a.m., Tuesday through Saturday, attending sporting events, interviewing athletes and coaches, and banging my head on the keyboard sitting at my computer writing features and game stories. The odd hours translated to a lot of odd eating, including way too many meals from the newsroom’s “Wheel of Death,” a giant vending machine with revolving shelves of pre-packaged, rubbery-looking sandwiches and other highly-processed offerings. 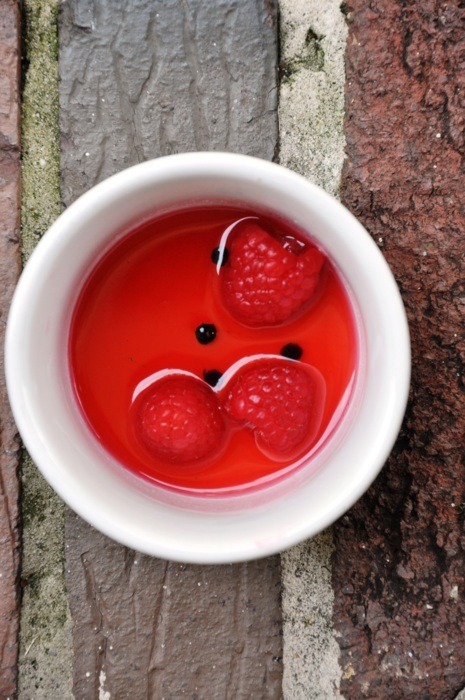 It was during my time in Fort Wayne that I started experimenting more in the kitchen. On my days off I cooked for myself, but my evenings at the paper? Not so much (enter: the Wheel of Death). Meanwhile, one of my best friends was quickly working her way up as a pastry chef in Birmingham. 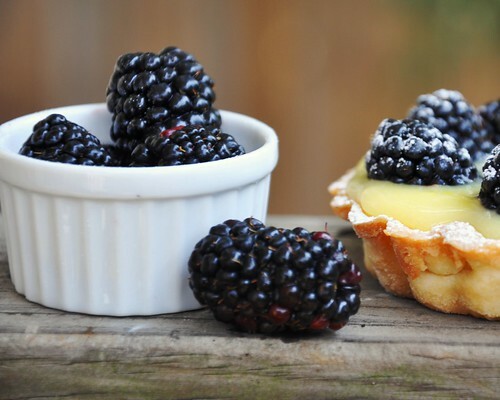 During one of our phone conversations, she described in great detail a dessert she was making with lemon curd. It sounded divine, and after we hung up, I could think of nothing but lemon curd. I called her back, and she was patient enough to walk me through her recipe. 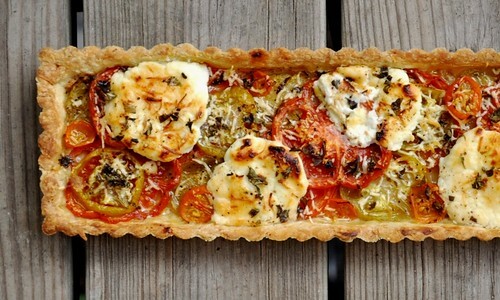 I finally made David Lebovitz’s “French Tomato Tart” over the weekend, a recipe I have been eyeing for quite a while. 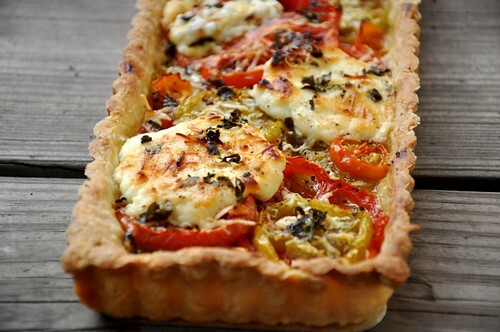 The tart features a rustic crust slathered with Dijon mustard, layered with juicy slices of ripe tomatoes, a dribble of olive oil, then topped with rounds of goat cheese and a scattering of fresh herbs. But the grand finale, mes amis, is what comes just prior to sliding the tart into the oven: a generous drizzling of honey, which in our kitchen happened to be some freshly-harvested honey from a neighbor’s family farm. 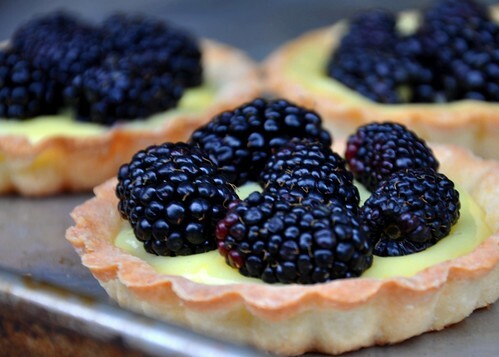 Let’s just say it’s a good thing I made two tarts. When my mother stopped by the next morning and requested a slice, I was embarrassed to admit there was only one piece left and it had been spoken for. 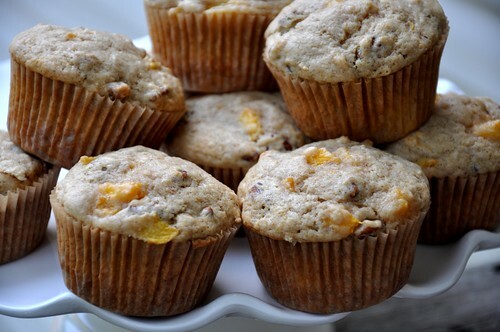 I made a few minor changes to the recipe. I added an extra layer of tomatoes because I couldn’t bear to waste any of the gorgeous heirlooms from Snow’s Bend Farm, one of my favorite stands at our local farmer’s market. 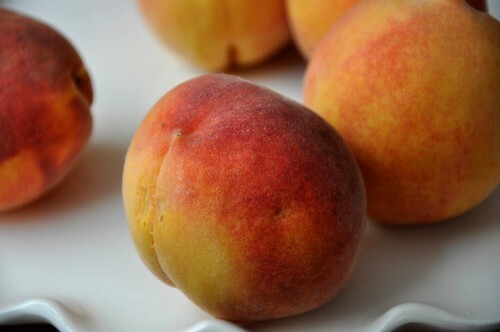 The varieties included Ozark Pink, German Johnson, Green Zebra and Sungold cherry tomatoes, and their hues of pink, red, green and orange made the tart really pop. A few years ago I discovered a particular way to cook steak, a method that produced a steak rivaling any I’d ever been served in a fine dining establishment. I’ve rarely ordered steak in a restaurant since. When perusing the menu at one of our favorite fine dining spots, Highlands Bar And Grill, I am occasionally tempted by the mouth-watering sides served alongside the steak (hello, duck fat-roasted butterball potatoes! ), but I don’t order it. Don’t get me wrong, I’m sure the steak is delicious, but I am quite content with my juicy, dare I say “perfect,” steaks that I can prepare in my home kitchen while wearing sweatpants and drinking a beer. We are not huge consumers of red meat, so we often splurge on grass-fed filets when steak is the main event. If you’re interested in tracking down local grass-fed beef, www.eatwild.com lists farms and distributors by state. You can also find a decent selection of grass-fed meat at most Whole Foods stores. 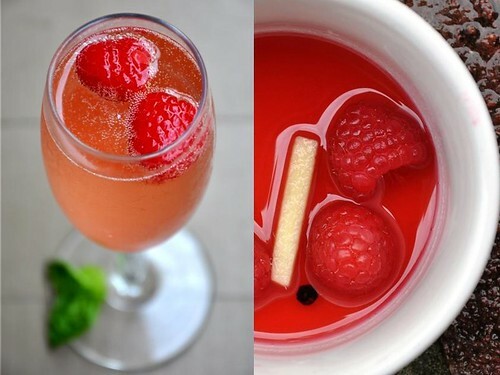 Summer 2011 is turning out to be The Summer of The Cocktail. I have had cocktails of all flavors, strengths and sizes on the brain since the temperature started rising, a hankering that is likely due to the fact that I was in this state for most of last year. A few months ago we hosted a neighborhood cocktail party to kick off spring. I plan to post a few recipes from that get-together, including the libation of the evening: pear sidecars with candied orange peel. Our sidecar kick was followed by an obsession with these, but after dining at Husk last week in Charleston, I’ve been craving something bubbly. Husk’s cocktail list was mighty inspiring and I pined for several drinks before choosing “Champagne and Raspberries,” which the menu described as “Champagne, Domaine de Canton-soaked raspberries, lemongrass and lavender simple syrup with black pepper.” I normally enjoy a glass of wine with my entrée. Not at Husk. Proper pairing be damned, I ordered a second glass of champagne, which I cheerfully sipped while dining on grouper. After much reminiscing about that memorable cocktail, I decided to create something similar for the summer evenings we spend visiting with friends on our front porch. This bubbly drink, with its bright fruit and peppery accents, brings me back to that special evening in Charleston. Some friends from Chicago were kind enough to gift me with this for my birthday – proof that I have acquired some of the cookbooks in my collection by honest means. At the time, I was trying to establish a balance of sorts on the home front: in addition to entertaining a five year old, running a business and keeping my husband from building more tipis in our backyard, I was caring for a new baby, which as many of you know is both wonderful and time-consuming. So when I first glanced at David Chang’s “Peas with Horseradish” dish, I was intrigued but initially put off because it called for ramen broth. Not your microwave-noodles-in-a-styrofoam-cup ramen broth – no, no – Chang’s recipe for ramen broth: a day-long process requiring five pounds of pork bones, four pounds of chicken, one pound of bacon and approximately three pounds of vegetables, among other ingredients. Just typing that makes me hungry, and I am certain the broth is well worth the effort, especially because the recipe yields five quarts and is not difficult, just labor-intensive. I am glad I decided to make the peas anyway, substituting chicken stock for the ramen broth, because this quick and flavorful dish has already become a summer staple. 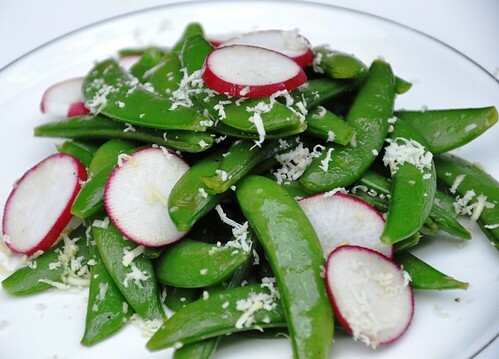 The stock reduces to a rich, soy-sauce-infused glaze that coats the snap peas, which are garnished with freshly-grated horseradish and paper-thin radishes. For a vegetarian option, vegetable stock stands in equally well. A few years ago I borrowed Rose Levy Beranbaum’s The Bread Bible from a friend, and I quickly came to the conclusion that although I valued our friendship, I would not be returning the cookbook. The original recipe for “Flaky Scones,” one of the book’s standouts, calls for currants. I didn’t have currants or other dried fruit handy the first time I made them, so I decided to substitute with what I did have in the pantry: several bars of quality chocolate. From the oven, the scones emerged golden on top and moist underneath, oozing with chocolate between flaky, buttery layers. They were, most certainly, no ordinary scones, and my husband and I ate that first batch within 24 hours. The genius of the recipe lies in the technique – folding and rolling the dough – which is responsible for creating all of those delicious layers.